Exuberant is the word that describes Madre de Dios with its infinite forests, sinuous rivers that rush towards the ocean, and life abounding in all its corners. Puerto Maldonado, the capital city, is an obligatory stop along the way to gain entrance to the national parks and reserves located in the area, and it has been, at certain moments, an important exporting site for rubber, wood, gold, and petroleum. At present, two de the main economic activities there are eco-tourism and chestnut harvesting. At only ten kilometers from Puerto Maldonado, or a one and half hour hike, you find Lake Sandoval, bordered by aguajales (swampy areas full of palm trees), orchids, kapok trees, caoba trees, and Mauritanian palm trees that grow up to thirty meters tall. The lake is also the home for a large variety de species such as toucans, macaws, parrots, egrets, tapirs, turtles, and the refuge for river otters and black caimans, two species on the brink de extinction. 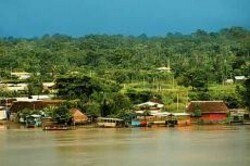 In the areas around Lake Valencia, 60 kilometers from Puerto Maldonado by the Madre de Dios River, there are several indigenous communities where the people make their living from fishing for tiger shovelnose catfish, gilded catfish, and paiche; this area is the habitat for plenty de flora and fauna, too. The Manu National Park (1,716,295 hectares), located in the departments of Cusco and Madre de Dios, protects more than 800 bird species, 200 species de mammals, gigantic trees, as well as being home to indigenous communities. This is the park that set the world record for the number of bird species seen in one day at one spot with 324 species. The Tambopata-Candamo National Park (274,690 hectares) is known to possess the greatest diversity de mammal, tree, insect, and bird species in the world as well as the world record for the amount de butterfly species. Additionally, the only humid tropical savannah in Peru is found at the Bahuaja-Sonene National Park (1,091,416 hectares). The highlighted species here are the manned wolf and the marsh deer, both close to extinction, as well as the giant anteater, giant river otter, the bushdog, the black caiman, and the harpy eagle.